Clearly, the extremely violent protests in Paris are different this time. That, right there, spells doom for the Macron administration. 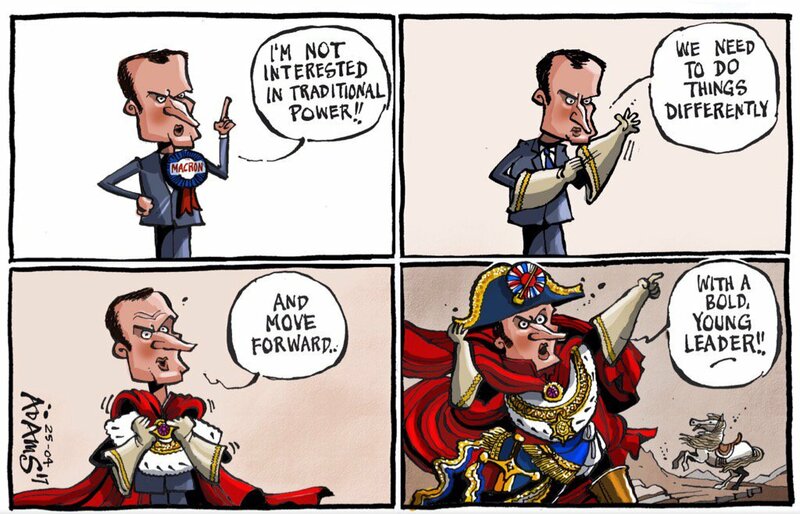 And especially for Emperor Macron! For it’s the people, free from labor union manipulation, who want justice…who want to be liberated from the EU plantation. This unrelenting Parisian protest is fundamentally a people-powered, grass-roots driven movement that will not tolerate any more Rothschild puppets governing them. In fact, the explosion of emotion on the Champs-Élysées is the result of the numerous offenses committed by the globalists against the French people over many decades. Now known as the utterly disastrous “Paris Agreement”, most Europeans understand that the underlying narrative that drove that whole process is absurdly false. Then, as if to add insult to injury, the current French king president announces yet another increase in the fuel tax that is none other than a disguised carbon tax meant to accelerate the country’s shift to green energy development. At the end of the day, the people now know that taxes are merely the means by which the banskters steal the hard earnings from the working class “in a socially acceptable way”. No one does it like the French when it comes to torching Paris; even Hitler was ever-so-respectful of the City of Light during the WW2 occupation. The whole world is now witnessing the authentic ire of the French people. There are many beefs here, not just the fuel taxes, but the tone-deaf Macron administration doesn’t get it. For example, the referendums that were held to determine Frances fate within the European Union were obviously rigged in favor of Fremain even though Frexit was by far more popular. The French people are quite a street-smart lot and knew in their bones that the globalists fixed the outcome of those referendums in advance. Because the citizens had no way of venting about that highly consequential outcome, it has festered for years waiting for a time to blow up. All the hard evidence points directly to a stolen presidential election in 2017. Marine Le Pen had all the momentum going her way, especially with the wind at her back blowing from a successful Brexit and victory for nationalist Donald Trump. Again, the French are not stupid and knew full well that Macron & Company (i.e. Rothschild Crime Syndicate) outright stole his election. Both the polls prior to the election as well as the exit polls pointed to a decisive win for nationalist Marine Le Pen. Again, the French were forced to sit in their stew-pot and simmer like frogs in boiling water seething with frustration and anger. Of course, the naturally autocratic and dictatorial Macron has been very easy to hate since his first official acts. Actually, the campaign season showed him to be an exceedingly immature kid who really had no right even being there. While the French are quite liberal in their marital affairs, the case of Immanuel Macron even makes most Parisians cringe with mortification. Their improper relationship at that time would be considered a criminal case of pedophilia and child abuse anywhere in the civilized world. Today, such an affair would be considered a pedo-crime under the rubric of Pedogate. Many say that she is really his MK-Ultra mother, or rather handler, or his Illuminati wife who was chosen for him when he was a mere babe so that he could be fastidiously groomed for his future presidency. What better way to mind-control an impressionable Manchurian Candidate to make the perfect decisions on behalf of the International Banking Cartel? And so he has. Writer Anne Fulda, who penned the book Emmanuel Macron: A Perfect Young Man, spoke to the politician’s parents about the scandalous affair that began while Ms Trogneux was a 39-year-old married mother-of-three. The schoolboy’s parents had believed their son was dating his teacher’s daughter, Laurence, until the truth came out through a family friend. Shocked at the illicit affair, the Macrons removed the intellectually gifted teenager from the school. The shaken parents met Ms Trogneux and asked her not to see their son again until he reached adulthood, but she defiantly told them she couldn’t “promise anything”. The French really do not like being lorded over. 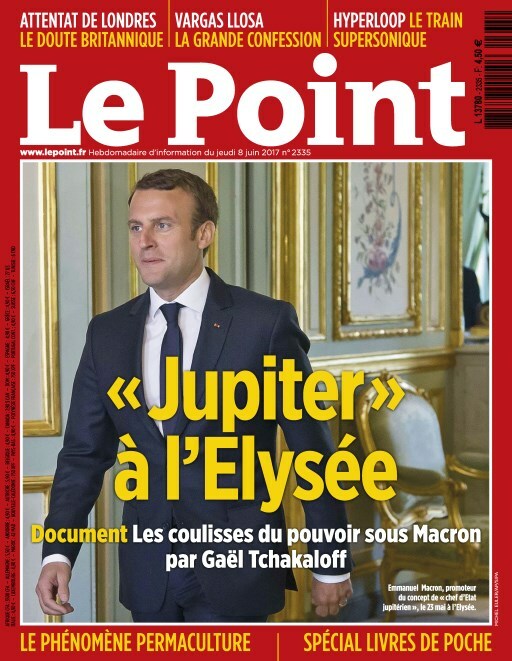 Hence, when Macron started referring to himself as Jupiter incarnate (the king of the Roman gods), many Frenchmen were understandably annoyed. Totally fake references to JFK during the campaign season also did not sit well with many. These were deliberately fed to the media by Rothschild agents to give the kid some shine that he desperately needed at a critical time in the race. However, it is Macron’s signature arrogance and dictatorial conduct as President that has made him the real enemy of the French people. 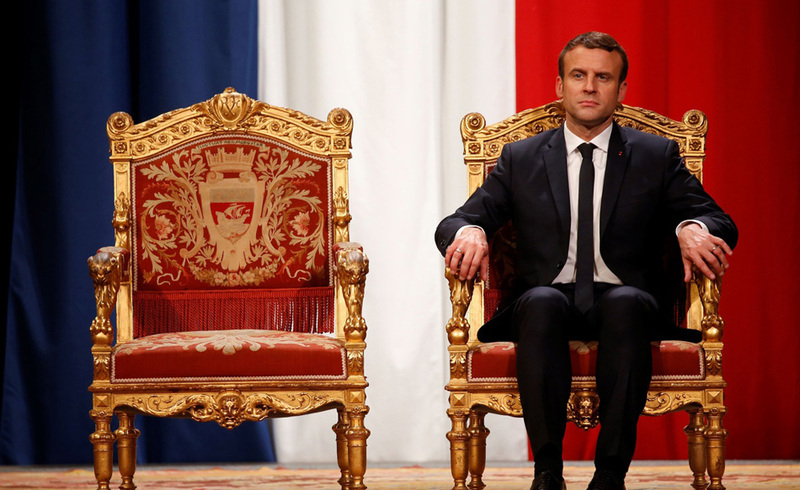 His globalist handlers have made the fatal mistake of setting him up as a petty tyrant in the same way that many French kings ruled—by decree and diktat. The longer Macron rules France as an autocracy, the more the citizenry becomes incensed. His behavior on the international stage has not helped his despotic image either. He interacts with his presidential peers as though he’s a high school kid running for class president, always trying to outdo and/or outshine them. The French really do not like being humiliated like this, just as Americans disliked being embarrassed by Obama’s immature behavior whenever he traveled abroad. The bottom line here is that Macron seemed to go out of his way to alienate the body politic in a manner never seen in any other French leader. Not only have the French people had to suffer all of these unbearable insults, they have had to tolerate being dominated by a former banker of Rothschild & Cie Banque. His rapid rise after being a Rothschild agent was so meteoric it made him a millionaire overnight; a transparent ploy to buy his loyalties which apparently worked liked a charm. 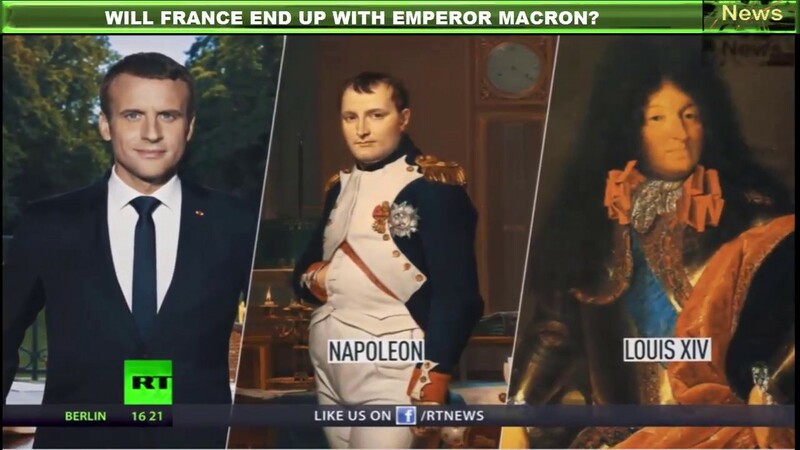 Compared to past French presidents and prime ministers, Macron has egregiously stood out as “The Emperor who has no clothes”. His official actions and personal conduct both reveal him to be nothing but a French marionette doing the bidding of his NWO masters at every turn. 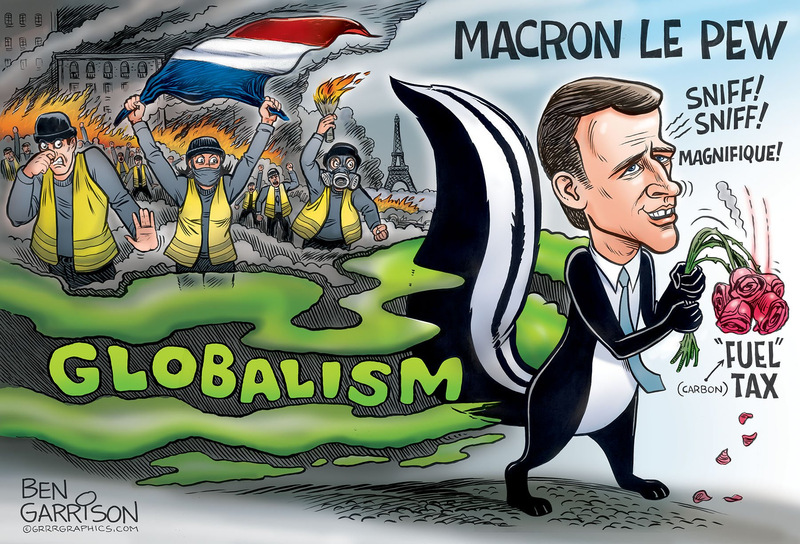 Being such a conspicuous tool for the globalists has made him the object of extreme scorn for every patriot and nationalist throughout the four corners of France. His presidential proclamations about the supremacy of the European Union over the sovereignty of France have been especially galling. Calling for a European army was particularly insulting to the proud French and their prouder military establishment. Last but certainly not least, Macron’s constant blowing of the trumpet of multiculturalism has made him an arch-enemy of every French patriot. The France of today is unrecognizable from only 10 years ago because of the Soros-funded operation to make multiculturalism the new normal of Europe. And Macron is the Rothschild bagman’s loudest mouthpiece in the Eurozone. RT.com got it right from the very beginning. His Shakespearean downfall was destined from the start because of his secret allegiance to the banksters and their New World Order agenda. In point of fact, no artificially propped up leader could weather the storms that are coming to France…surely not in 2018 and 2019. The world is onto the New World Order agenda like never before, and especially onto their scheme for a One World Government. Never has the tale of Humpty Dumpty been so poignantly re-enacted on the-post modern stage as the predictable tragedy of Immanuel Macron’s downfall. A quick review of this exposé really makes one wonder how Macron lasted so long. After all, the electorate was disgusted with him after his first 100 days. The French are well known for their impatience; so why are they only now “storming the Bastille”?! Regardless of what happens this weekend in Paris, Macron’s days are numbered. Therefore, the 64 thousand dollar question is: Who will the globalists replace him with?